In the Weir-Jones Engineering Consultants’ arsenal of test equipment is the Ling Dynamic Systems V722 shaker table. This table is capable of producing sine wave forces up to 4100N (922lbf) instantaneous or up to 2600N (587lbf) continuous. Both sinusoidal waveforms and random signals can be used as an input for this shaker table. Typical vibration frequencies range from 5 to 4000Hz. Weir-Jones has an integrated computer system; this is used to program and monitor the waveforms to and from the table. We have a collection of mounting and adapter plates that allow for three-axis testing of components. Additionally, we offer custom adapter plate manufacturing for any hole pattern. 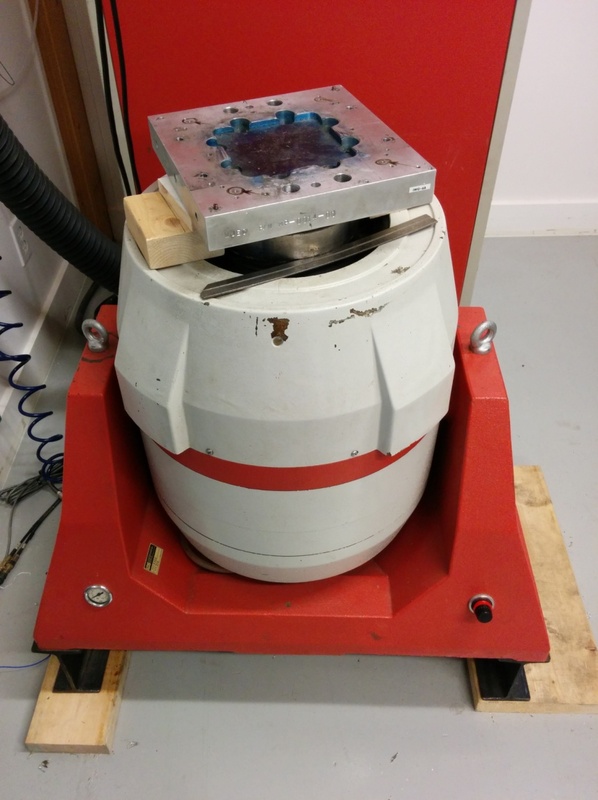 Our shaker can be used to test any part up to a maximum of 100kg (220lbs). 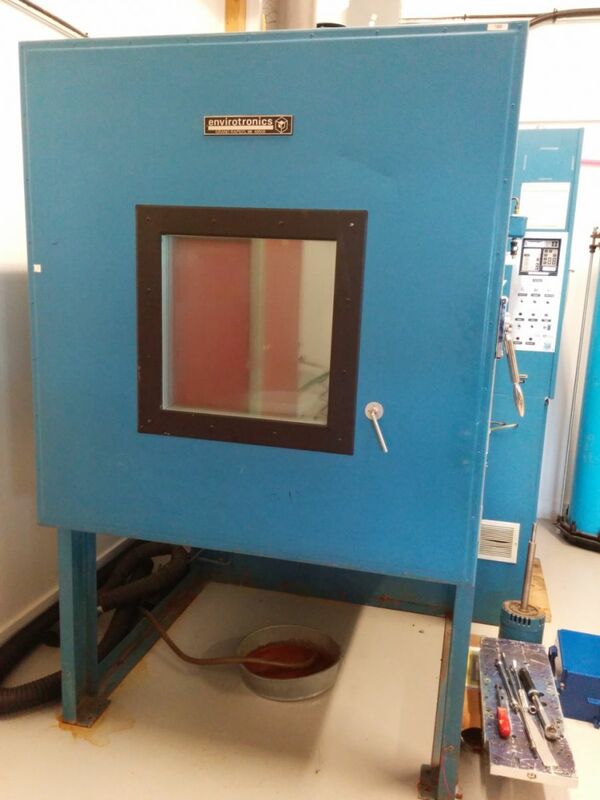 The environmental chamber at Weir-Jones Engineering Consultants Ltd. is an Envirotronics EVH33-2705. Equipped with a Micristar 828 Digital Process Controller, our chamber can maintain temperatures between -73°C and 177°C with +/- 0.4°C accuracy. The Micristar allows for manual temperature inputs as well as programmed temperature profiles for a variety of testing needs. We maintain a yearly temperature calibration schedule, so our chamber is always calibrated and ready for testing. Installed with the chamber is a humidity mode, which can regulate the internal humidity between 20% and 95% RH. The chamber accommodates small to medium sized components or assemblies with an internal volume of 33 cubic feet. Note that it is possible to operate the vertical shaker table below the environmental chamber and perform “Shake and Bake” testing (as shown in unit photo). Full operational range of all equipment is possible during simultaneous operation. Controller: Micristar 828 or external computer control; can be used to trigger shaker system. Includes: 20" x 20" window and cable access ports. up to 25 kg at various accelerations and velocities. calibrated 1000kN (224kips) proving ring. The medium test frame utilizes an Eagle Pro ESH-202 hollow single acting cylinder, which is rated for a maximum of 20 metric tons (tonnes). Because we use a hollow cylinder, it can be flipped around to test both compressive load cells and tension link load cells with the same frame. 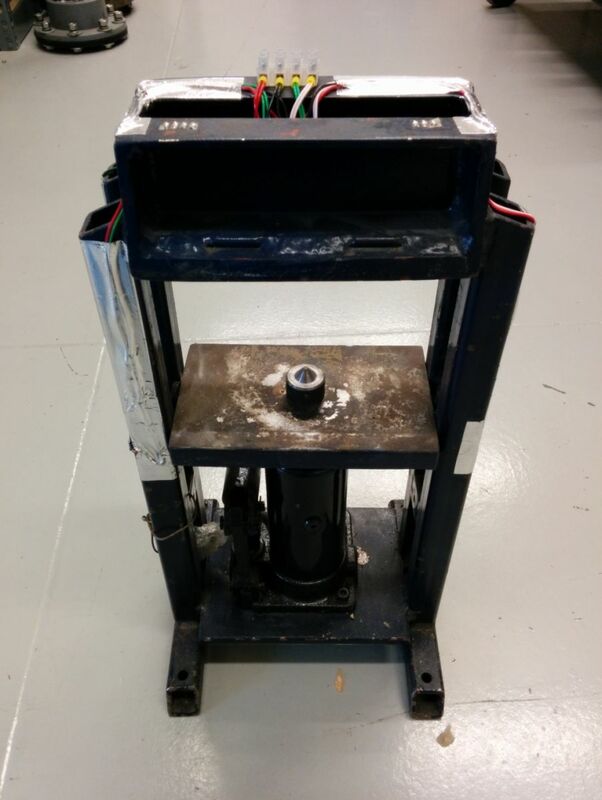 The frame is also easily adjustable, so any size of load cell or component can be calibrated or tested up to a maximum of 40 inches. We use a hand pump with pressure gauge to extend the cylinder. Our calibrated load cells can be used in this test frame, connected to a datalogger; or we can use a 20 kip proving ring, depending on your testing needs. 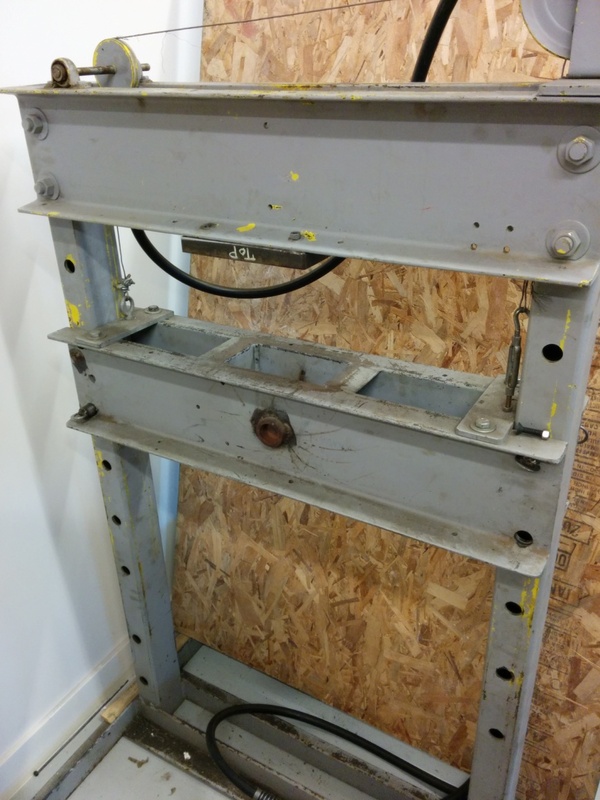 The rock point load test frame is a small hydraulic test frame that has been specifically modified to perform a rock point load test for geotechnical testing. 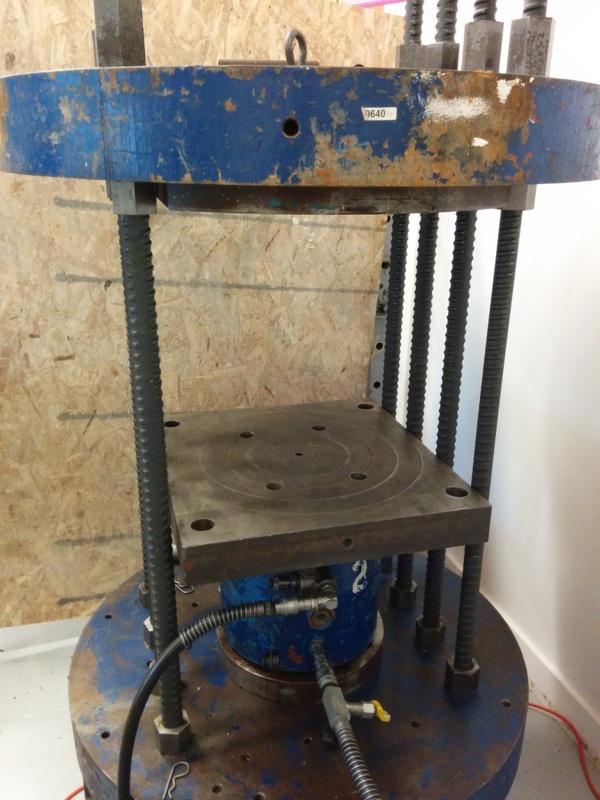 The test setup employs a 4-tonne bottle jack, test frame instrumented with a full bridge strain gauge, and two conical platens for crushing the rock sample. The frame is such that it can clamp in a vice to provide stability. Depending on sample size, our rock crusher can test samples up to about 50MPa ultimate compressive strength.